Congratulations to Book Arts MFA candidates Sonia Farmer (second year), Christine Manwiller (third year), Michelle Moode (third year), and Kazumi Wilds (third year)! Each of these women has been selected as a Caxton Club Grant awardee for the 2017-2018 application cycle. In total, six winners were selected from a competitive pool of applicants. Sonia Farmer is using her erasure of Richard Ligon’s 1657 guidebook, “A True and Exact History of Barbadoes”, to disrupt the teleology of colonial Caribbean history. Her fragmented poem features an unreliable narrator and shifting landscape to interrogates the idea of total history within the Caribbean region and calls into question what it means to write “a true and exact history” of anything. Christine Manwiller will continue her MFA thesis work on botanical contact printing (“eco printing”) and calligraphic book editioning. 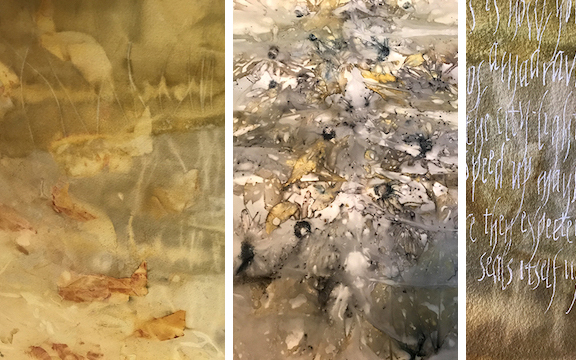 This first part of her research will continue investigations into three different eco printing processes, and will culminate in a hand-bound resource book aimed at book artists who want to dye/print on paper. The second part of her project will use botanical contact prints in a series of artist books. Using binding structure and hand calligraphed text, she will carry out a series of works that visually support poems of Palestinian writer Alice Yousef. “First I am going to make the field guide, then I am going to make the field.” Michelle Moode is creating a letterpress printed artist’s book that will use conventions of field guides to explore and present a vocabulary of personal symbols, mark-making, and record keeping. It will include references to the natural world, things large and small, representations of quotidian objects, as well as more ambiguous or imagined forms. The work of KOJIKI has captivated Kazumi Wilds for much of her life. The myths of “KOJIKI,” or Records of Ancient Matters, are Japan’s oldest surviving written work, authored by O-no- Yasumaro at Emperor Temmu’s request and completed in 712 CE. Wilds aims to share these generationally-transmitted classical stories that portray the indigenous culture of Japan through her interpreted images and texts. 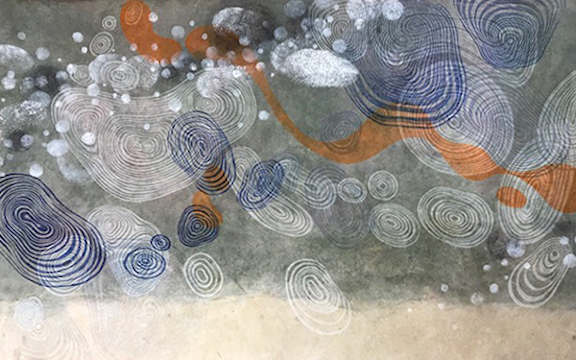 Using a vast array of craft techniques from paper making to printing to binding, she envisions this project as a synthesis of Eastern and Western techniques and materials. Congratulations also go out to Nicole Cotten (third year), Sarah Luko (third year), and Elise Hochhalter (third year), as they received Honorable Mentions by the Caxton Club.